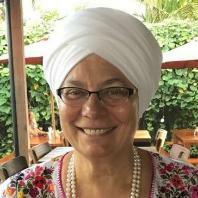 Cookbook author, cleansing expert and Kundalini Yoga teacher, Deva Khalsa embodies the spirit of a healthy lifestyle and began practicing this lifestyle based on the technology of Kundalini Yoga in Vancouver, Canada in 1992. In 1996 she moved to Espanola, New Mexico, the mother ashram for Kundalini Yoga and began studying yoga and Ayurveda with Yogi Bhajan. Since December 1999 she has been managing The Cleanse of Santa Fe, Whole Self Recovery and Yoga Southwest in New Mexico. Deva is passionate about empowering people to take control of their health and lives with Ayurveda and Yoga. In addition to being the co-creator of The Cleanse of Santa Fe™ she is an Ayurvedic Health Practitioner and works individually with clients on personal care and creating healthy lifestyles and diets. Sat Nam. I taught my first Kundalini Yoga class in February, 1973 at Guru Ram Das Ashram in Los Angeles and have taught over 3,000 classes since then, including classes at UCLA Extension, University of New Mexico, and many locations in the San Francisco Bay Area, teaching three classes per week for over 10 years before resettling here in New Mexico. I began teaching Level One Aquarian Teacher Training in the San Francisco Bay Area beginning in 2001 through 2006, and am currently enrolled in the Academy at the Professional Trainer level. 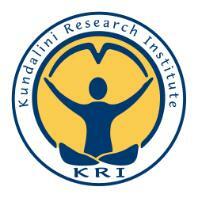 Since 2007 I have been working with The Kundalini Research Institute. In addition to participating in our Level One Immersion Course each summer, I serve in many capacities including customer service, product management, marketing management and selling at events such as Summer Solstice and Sat Nam Fest. Guruka Singh is a teacher, writer and inveterate punster. 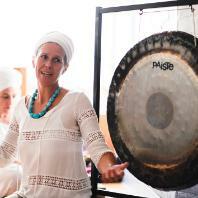 He is one of the original teachers trained by Yogi Bhajan, and he has been teaching Kundalini Yoga since 1971. He travels around the world to teach as well as teaching through the "SikhNet Inspirations Video" series on YouTube and SikhNet. His love of poetry and Gurbani have led him to translate Yogi Bhajan's Gurmukhi poems in Furmaan Khalsa as well as translating Japji Sahib and other Gurbani. The original founder of SikhNet, he now lives under the blue skies of New Mexico with his beloved Khalsa family. S.S. Gurumeet Kaur Khalsa, E.R.Y.T. 500, is a Minister of Divinity of Sikh Dharma, Director of Create Inner Peace, Professional Teacher Trainer of Kundalini Yoga, Associate Instructor of SuperHealth and Certified Magi Counselor in Numerology. Gurumeet specializes in yogic technology to manage stress, recover from post-traumatic stress, heal addictions, and take control of our own health and well-being. 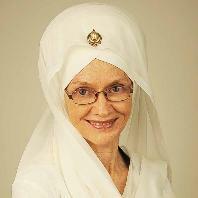 Teaching through Northern New Mexico College (www.nnmc.edu), Create Inner Peace and the GRD Health Center in Espanola New Mexico, Gurumeet studied for more than 30 years with Yogi Bhajan and served as one of his body guards. 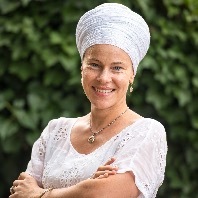 She works closely with Bhai Sahiba Bibiji Inderjit Kaur Khalsa, PhD, Chief Religious Minister of Sikh Dharma, wife of Yogi Bhajan, and founder of Create Inner Peace. Create Inner Peace strives to give back to First Responders—who daily serve and protect society, often placing themselves in harm’s way—while encountering overwhelming critical incident stress. Open to everyone, Create Inner Peace helps relieve stress and increase vitality and resiliency and provides technolgoy for our individual and collective transition to an open heart world, our timeless connection to our eternal, sacred being, and the co-creation of a world of prosperity, peace and justice for all people now. Dr. Kartar S Khalsa has been teaching for over 23 years. He has taught classes on a wide variety of topics from relationships to prosperity to pranayam to cleansing and detoxing. Dr. Kartar has assembled teams of talented people in New Mexico to run comprehensive residential programs for addiction, wellness and medical treatment. 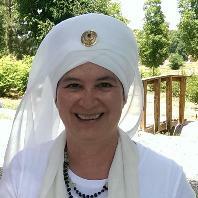 With Kundalini yoga always as the link pin of true long lasting healing. He has taught weekly for almost the entire time he has been a teacher. Dr. Kartar was instrumental in starting a kundalini yoga center in his home in Espanola NM for 8 1/2 years and in his clinic for 5 years. He became a lead trainer and was part of a successful teacher training group that brought teacher training to Santa Fe NM. Currently teaches at a residential addiction treatment center in Santa Fe. While running his busy Acupuncture practices in Santa Fe. I am a graduate and former Chairman of Miri Piri Academy and have been participating in Kundalini Yoga Teacher Training since I was a teenager. 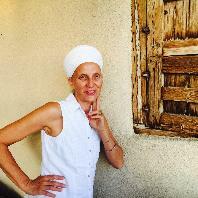 Yogi Bhajan asked me to be a musician and a teacher, travel the world, and inspire the people. Fulfilling his directive is my prayer and purpose.